Byco Lubricants | Byco Petroleum Pakistan hosts a grand dinner for Faisalabad Industrial business Icons ! Byco Petroleum Pakistan hosts a grand dinner for Faisalabad Industrial business Icons ! 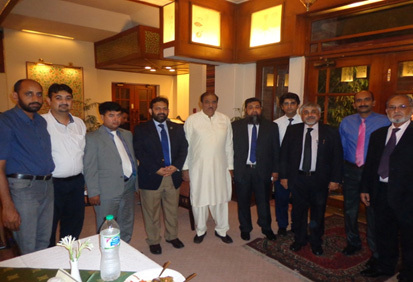 Faisalabad – A city called the Manchester of Pakistan, the Byco industrial lubricants sales team – Faisalabad hosted an impressive and a lively dinner for Industrial customer on 25th September 2014 at Serena Hotel. Business owners from different segment of textile sector like Spinning, Weaving, Processing, Hosiery, etc attended along with fleet owners supporting the exports of industries operating in Faisalabad. President Faisalabad Chamber of Commerce and Industry Mr. Sohail Bin Rashid and Chairman Faisalabad Dry Port Trust Ch. Muhammad Siddiq were the guest of honor. Other Business icons from renowned Industries were represented by their CEO’s, Managing Directors , General Manager’s, Plant Manager and Head of Purchase who graced the dinner . Our existing customers Dawood Usman Textile Mills – Directors Mr. Imran & Mr. Abdul Raheem , Mr. Waseem Ashfaq, Director Ashfaq Textile, Mr. Hafiz Abdul Lateef GM – Ashfaq Textile , Mr. Khizar Yaqoob – Director Sohni Dharti Textile, Mr. Umar Daraz – Director KB International strongly graced the event through their presence and endorsed amongst the sector , Byco’s product performance and quality standards that were in their use. A total of 47 high profile industrial Icons from Faisalabad attended our dinner invite and assured Byco representatives and the Lubricants team of their support and long term business partnership in promoting Byco industrial lubricants in Faisalabad . This occasion addressed and delivered a prime message of Byco Petroleum’s soft launch of its industrial grade lubricants in Faisalabad and of Byco’s presence in this this territory. The guests showed high interest & curiosity in Byco industrial products range, quality and after sales services, technical services and were high impressed by the professional skills and rich expertise of Byco’s lubricants team interacting with them in the field . This session inculcated a strong message in the minds of the customers of Byco’s lubricants team commitment to forge a new dimension of business partnership that was strongly based on Byco’s product performance and strong technical support services – a Customer Value preposition that was instrumental in winning the trust and appreciation of the Faisalabad Industrial owners. Byco team’s presence included Sheikh Ata U Rehman – GM Retail Services, Mr. Aamir Millwala – Head of Lubricant, Mr. Hasan Ali Khawaja –Sales Head -Industry Lubricant and Mr. Khalid Mahmood – ZM Central Region who took on a lead role in addressing all the queries /concerns /ambiguities of our customers about BPPL, our lubricants product range, technical service support and of Byco’s plan to extend its business operations across Pakistan. The Fuel Experts – Byco’d distributors in Faisalabad lead by Mr. Tauseef Bari and Mr. Hamid Khan – CEO actively participated and in this session and were introduced as our authorized Distributor of Byco industrial lubricants in Faisalabad and Lahore territory.